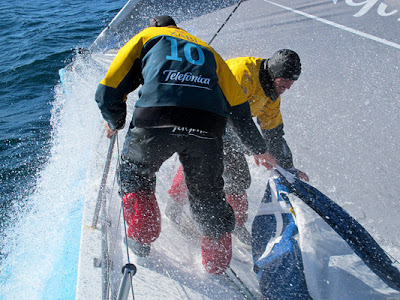 A thrilling climax to Leg 5 could be on the cards after the top three boats entered the final 1,000 miles on Tuesday split by less than 100 miles, while on the other side of South America, CAMPER suspended racing. The South Atlantic match race between Groupama sailing team and PUMA Ocean Racing powered by BERG continued with gusto, with Franck Cammas’ French team holding a 0.7 nautical mile lead over Ken Read’s PUMA. 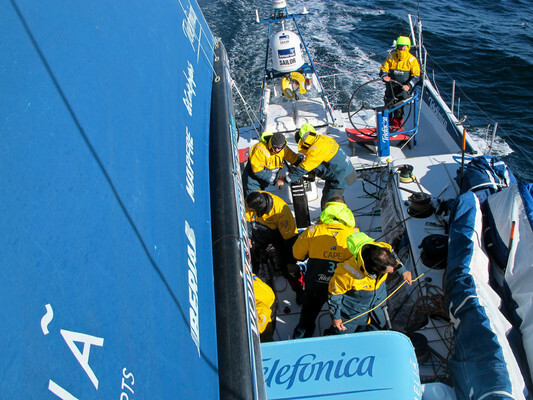 And after a mounting a comeback that saw them pull back more than 300 nm in three days, Telefónica were back in the running, hunting the leading pair. 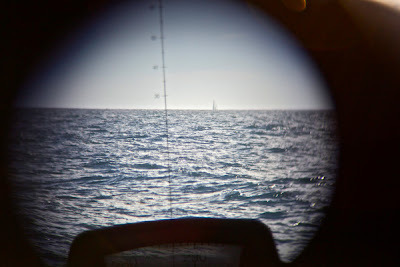 Groupama and PUMA have been in sight of each other for more than 24 hours, separated by no more than 6.5 nm. PUMA navigator Tom Addis said the team were employing every weapon in their arsenal, including old school match racing tactics. “You’re just trying to make incremental gains here and there, sticking together and cutting down the risks, so it’s much more like match racing than offshore racing at the moment,’’ he said. Addis said his team were reveling in the close-quarters scrap, especially having sailed a “pretty lonely race”, including detouring to the world’s most remote inhabited island with a broken mast in Leg 1 and blazing their own trail hundreds of miles from the fleet in the Leg 4 race from Sanya to Auckland. “It’s really nice to have company, everyone’s enjoying have another boat around, it gives us a good gauge,’’ he said. Team Telefónica, in third, couldn’t physically see their rivals but had Groupama and PUMA in the crosshairs after reducing the distance to the leading duo to 95 nm. The team’s average speed over the past 24 hours was more than 14 knots, while Groupama and PUMA are unable to muster more than 10 knots. 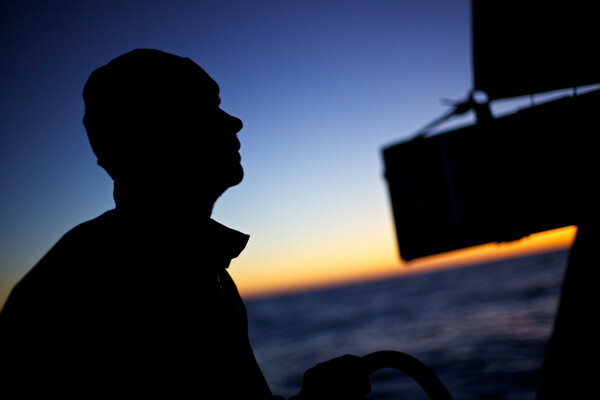 Navigator Andrew Cape was modest about the turnaround, putting it down to the weather gods. Cape said he was enjoying the opportunity to be on the attack from the rear of the fleet, rather than defending from the front. 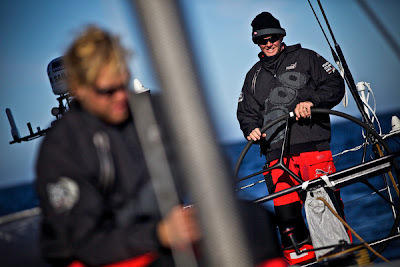 Meanwhile, CAMPER with Emirates Team New Zealand suspended racing at 0130 UTC on Tuesday. The team notified race management of the move while just south of Isla Guafo, about 180 nautical miles from their destination Puerto Montt. Shore manager Neil Cox said the team expected to reach the port later tonight, and would begin work immediately. Cox said a team of six shore crew plus an ultrasound technician would work on the damaged hull, which could take from three to seven days. CAMPER skipper Chris Nicholson said he was hopeful the team could complete the repairs and sail the remainder of the leg in time to compete in the Itajaí In-Port Race. “The sooner we get our repairs done, the sooner we get underway again,” he said. “We’re looking forward to as much time as we can have in Itajaí before in-port racing, so we’re looking at two weeks down the track from now. 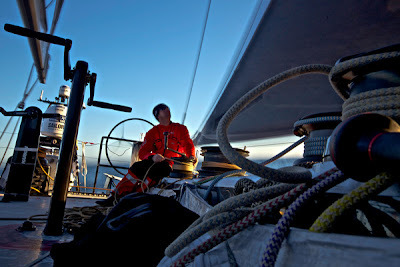 Abu Dhabi Ocean Racing are continuing to trek towards the Chilean coast in fifth place, while assessing their options.